I wish I could say that tonight’s dinner was brought on by a rush of sentimentality leftover from last week’s big anniversary; unfortunately, the rotton avocado that I was planning to make this with deserves the credit. 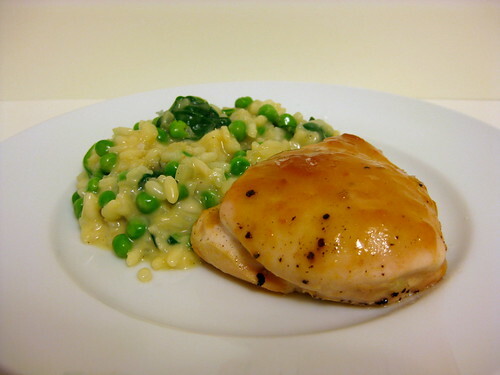 See, apricot-Dijon chicken with [mushroom] risotto (plus a salad, gelato) is the first meal I ever cooked for David. Before you’re all like, aww, how sweet or whatever, let me add that I had invited a whole group of my friends over to my dorm room to eat, too — (lowers voice, points to the dude) I wasn’t so sure about that one as a date, date at that point. It’s quite possible (definitely so) that this little detail was unbeknownst to him until he saw me prepping a ridiculous amount of food for just two people. Surprise! Anyway, the original recipe calls for chicken thighs, which one half of us likes more than the other — agreeably, breasts work well in their place. While the meat is certainly drier, the accompanying sweet-tangy sauce more than makes up for it. As for the risotto, I just threw together the old standby, stirring in some warmed up frozen peas (eight ounces) and a bag of baby spinach (six ounces) along with the Parm at the end. And so dinner was saved! Combine preserves, honey and Dijon in a small saucepan (2-quart). Set over medium heat and bring to a boil. Cook, stirring occasionally, until reduced by about half — about 5 – 10 minutes. Remove from heat and allow to cool sightly.